The College of Arts & Sciences recommends you meet with your professional advisor to review your preliminary degree check once you have completed approximately 90 hours or when you are within a few semesters of graduating. You may login into your ULink Student Center and click on “Who is My Advisor?” and you will see your assigned professional advisor. 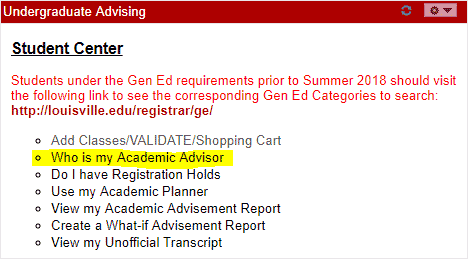 If you are an Honors student, you will need to meet with your assigned A&S advisor. You may email your advisor directly or make an appointment. The results of your meeting will let you know what classes you still need to complete in order to earn your degree. For optimal planning - it is wise to meet with your professional advisor before you plan to register for your last semester of courses. That way you have time to think about course availability and scheduling details. Keep in mind that 30 of your last 36 hours must be taken at the University of Louisville (unless you are participating in a study abroad program sanctioned by the university. 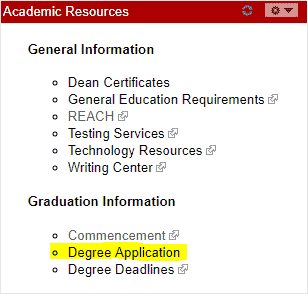 If you intend to graduate during the current semester - you can go directly to the ULink Degree Application.